Endelig har jeg begynt å forstå verdien i det de kaller Mitochondrial Uncoupling. «Uncoupling» innbærer at mitokondriene produserer varme istedet for ATP. I denne prosessen produseres faktisk mer CO2 enn når mitokondriene produserer ATP (energi-molekyl). Overproduksjon av ATP skaper problemer i cellene. Jo mer ATP jo raskere vil cellen bli overstimulert og dø. Det er «uncoupling» effekten som gir oss livsforlengelse. Jo større evne mitokondriene våre har til å bli «uncoupled», jo lenger vil vi leve. In bioenergetics, ‘uncoupling’ refers to any process through which energy released from the combustion of substrate (food) in the mitochondria is not conserved. The final steps in the oxidation of substrate are the transfer of electrons to oxygen, forming water, by the respiratory chain. The energy released is used by the respiratory chain to pump protons out of the mitochondria, as seen in Fig 1A. In most mitochondria, the majority of these protons re-enter through the ATP synthase, and the energy is used to synthesize ATP. However, if the protons re-enter by any other means, the mitochondria are considered to be uncoupled. As energy in this process is transferred to heat and not stored as fat in the body, the activity of the uncoupling protein(s) can be viewed as an anti-obesity mechanism—a possibility that has attracted much attention, as both pharmaceutical companies and the general public are looking for easy ‘slimming’ agents. Uncoupling (measured as thermogenesis) is only observed when the cells are adequately stimulated, for example, by norepinephrine (Fig 1B). However, it was the opinion of several participants at the meeting (in particular, E. Rial, Madrid, Spain, and J. Nedergaard, Stockholm, Sweden) that fatty acids do not participate in the uncoupling process. Instead, the fatty acids function only as anti-inhibitors by relieving the inhibition caused by the purine nucleotides (ATP and ADP) present in the cells—and experimentally by GDP in isolated brown-adipose mitochondria studies (Fig 1B)—prinicpally in accordance with suggestions by Nicholls from the 1970s. 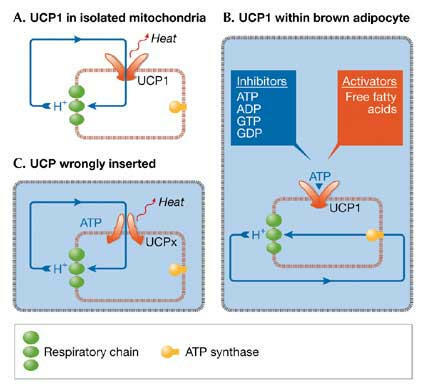 The most discussed hypothesis at the meeting was that UCP2 and UCP3 do indeed function as uncoupling proteins, but only when oxidative stress (superoxide production) can be ameliorated by their activity. This is generally presented as the ‘mild-uncoupling’ hypothesis (Fig 2). It was debated whether this type of ‘not thermogenic but still membrane potential lowering activity’ is bioenergetically possible. However, the oxidative-stress protection function is supported by the observation that macrophages from UCP2-null mice produce more superoxide, which results in a chronic activation of the NF-κB system with expected inflammatory consequences (S. Collins, Research Triangle Park, NC, USA). In addition, mice without UCP2 are more susceptible than normal mice to chemically induced colon cancer. Brand suggested that the UCPs—whether or not this includes UCP1 is still open—specifically protect against oxidative damage caused by fatty acids, particularly polyunsaturated fatty acids from membrane phospholipids. These fatty acids can be attacked by mitochondrially-generated superoxide that converts them into 4-hydroxy-2-nonenal (HNE) and then interacts with the UCPs to make them able to conduct protons (or an equivalent). This ‘mild uncoupling’ would decrease the membrane potential and thus diminish the rate of production of superoxide; that is, this would be a self-regulating protective system. Uncoupling protein 1. 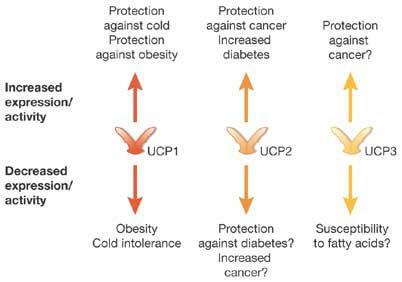 In mammals, UCP1 is found only in brown adipose tissue. 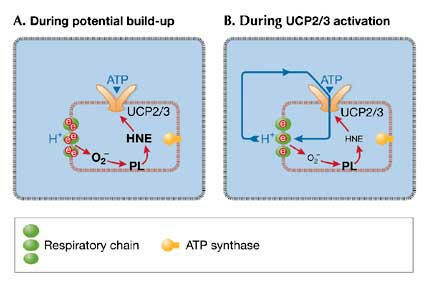 Uncoupling protein 2. UCP2 mRNA has been detected in macrophages, lymphocytes, thymocytes, pulmonary cells, enterocytes, adipocytes, pancreatic β-cells and certain neurons and, at a lower level, in liver, muscle and kidney cells. In the brain, UCP2 gene expression is generally low but high levels of UCP2 mRNA have been found in some regions, such as the limbic system and particular subdomains of the hypothalamus (D. Richard, Quebec, Canada). Uncoupling protein 3. UCP3 expression levels in the skeletal muscle of animals or humans respond to changes in fatty-acid flux (F. Villarroya, Barcelona, Spain; Harper; Dulloo; Schrauwen). The thyroid hormone tri-iodothyronine has a positive role in the control of UCP3 expression (F. Goglia, Benevento, Italy). During oxidative phosphorylation electrons from reduced substrates are picked up by ubiquinone (Q) on complex 1 of the mitochondrial membrane. As these electrons are passed from complex 1 down the cytochromes the released energy is used to pump protons across the inner mitochondrial membrane creating a protonmotive force. Finally, in complex 4 the electron combines with a proton and oxygen to form water. The hydrogen ions pass back across the membrane via ATP synthase, resulting in the generation of ATP from ADP and inorganic phosphate, although occasionally protons leak back through the membrane without the creation of ATP, either as a membrane leak or via a specialized protein called an uncoupling protein (UCP), which allows the proton to pass uncoupled from the generation of ATP, but resulting in release of the stored energy as heat. Occasionally, however, this process goes wrong and the oxygen reacts with a reduced form of Q, called ubisemiquinone (QH), which results in generation of a superoxide free radical (O2−) (60–63). Animals can reduce the levels of protonmotive force by increasing the extent of uncoupling in their mitochondria. To continue to generate ATP requires elevated oxygen consumption, although the net production of free-radical species is diminished. The animals uncouple respiration to increase their survival (63). This effect is diametrically opposed to the prevailing notion that increasing uncoupling should lead to an increase in free-radical production because of the elevated oxygen consumption (95). Our data are consistent with a protective effect of uncoupling respiration and, consequently, our current efforts are directed at resolving whether those MF1 mice with high-energy expenditures have more uncoupled mitochondria, or elevated levels of protection and repair processes. Mice in the upper quartile of metabolic intensities had greater resting oxygen consumption by 17% and lived 36% longer than mice in the lowest intensity quartile. Mitochondria isolated from the skeletal muscle of mice in the upper quartile had higher proton conductance than mitochondria from mice from the lowest quartile. The higher conductance was caused by higher levels of endogenous activators of proton leak through the adenine nucleotide translocase and uncoupling protein-3. Individuals with high metabolism were therefore more uncoupled, had greater resting and total daily energy expenditures and survived longest – supporting the ‘uncoupling to survive’ hypothesis. The work we performed on mitochondria extracted from the second and third cohorts of mice, in combination with the first cohort [Fig. 1] where we showed that mice with higher metabolic intensities lived longest, provide greater support for the ‘uncoupling to survive’ hypothesis than for the ‘rate of living-free-radical damage’ hypothesis, at the level of individual phenotypic differences in metabolic intensity. Since we used an outbred strain kept in constant environmental conditions, presumably these phenotypic differences have a genetic component at their origin; this conclusion is supported by the fact that the same association between longevity and metabolic intensity is also observed across inbred strains (Storer et al., 1967). Characterization of the folate-dependent mitochondrial oxidation of carbon 3 of serine. In contrast, CO2 production was greatest in uncoupled mitochondria and lowest in respiratory-inhibited mitochondria. Dette innlegget ble publisert i Forskning og artikler og merket med CO2, mitokondria, oksidativt stress. Bokmerk permalenken. ← Metabolic Fingerprint of Dimethyl Sulfone (DMSO2) in Microbial-Mammalian Co-metabolism.